Celebrate in style! Suitable for pre-schoolers from ages 3 upwards up to about age 6. These workshops are all about sticky fingers and chocolate fun. The workshop is limited to one hour - enough time for our guests to create a chocolate pizza masterpiece using milk chocolate decorated with your child's choice of speciality chocolate inclusions such as marshmallows, chocolate curls, buttons, fudge, brownie and other delicious treats. With stirring, pouring, decorating and, of course, eating children love joining in the chocolate fun. 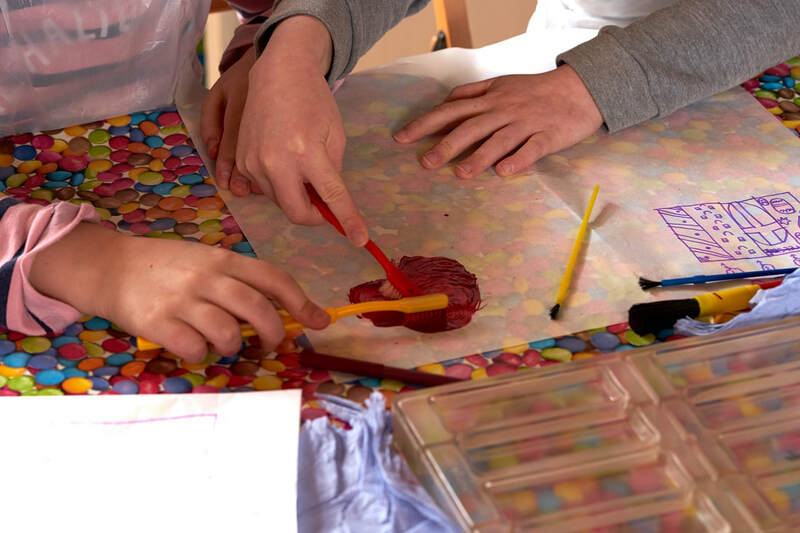 Our workshops are run by chocolatiers who are experienced in working with children of this age and most of our senior team are either also in education or have small children of their own. 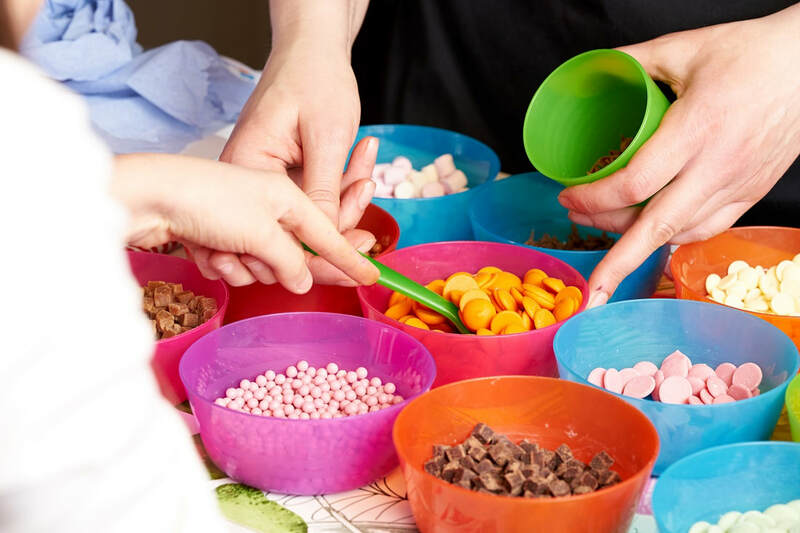 The basic party cost including all tuition, ingredients and packaging needed to transport children's creations home with them is £150 for up to ten children including the birthday child. Up to six additional children can be added at a cost of £12 per child. 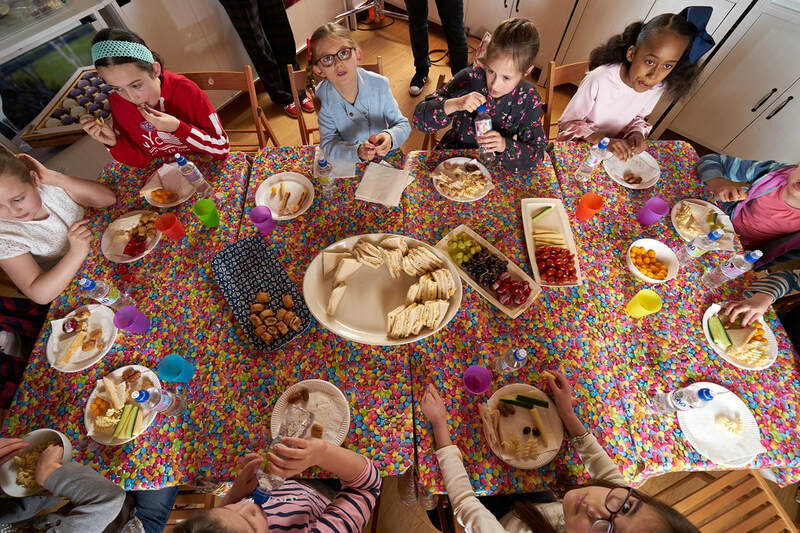 Party food and drinks can be ordered through us which will be provided by and eaten in the Cowshed café children's menu (must be pre-booked) at a cost of £6 per child. A range of sandwiches, toasties and hot meals are available and the price includes a choice of water or squash to drink. Children will be escorted to the Cowshed by our chocolate team. Parents meals are also available. Alternatively, you can hire The Chocolate Shed for an extra 30 minutes for £15 and serve your own party food as part of the party. Please remember that The Chocolate Shed aims to be 'nut free' and therefore we ask that you do not bring nuts into the building with your party food. A choice of orange or blackcurrant squash (or water) can be provided at a cost of 50p per child. You are welcome alternatively to bring your own drinks. In addition to this we also offer a deluxe, sustainably sourced, full party bag option. This includes a children's chocolate themed wordsearch, hand made chocolatier's medal for completing the workshop, real hot chocolate pack with marshmallows and using Henley Chocolates locally, sustainably sourced chocolate and a bamboo wooden stirring spoon together with the children's chocolatey creations. The cost of this option is £6 per bag.